Whatever the initial cellular target, one thing is fairly well-established; the cellular site of long-term EBV persistence is B-lymphocytes [39, 40]. These cells can be transformed and immortalized by EBV when grown in in vitro cultures. [...] an efficiently functioning immune system is essential to keep EBV infection under control and maintain a homeostatic virus-host relationship. 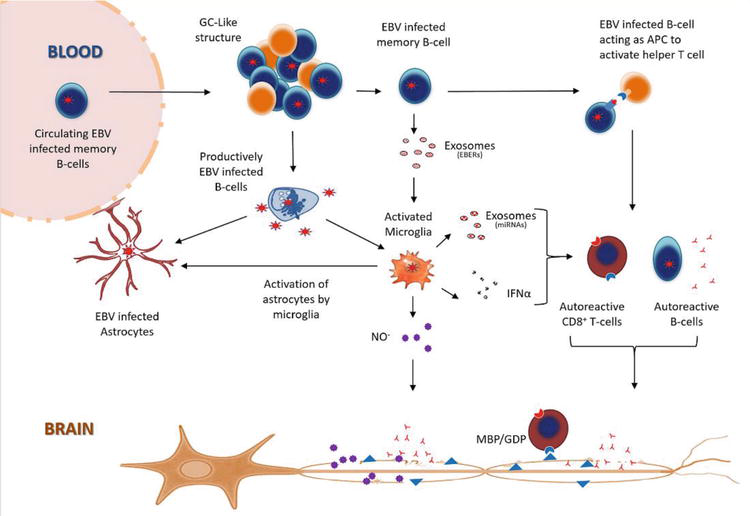 Thus, any disruption of the intricate connection between EBV and the immune system can lead to serious health conditions, for instance EBV-induced malignancies and some autoimmune disorders such as MS.
[...] the identity of the target antigen for the autoreactive T cells remains elusive. A very recent study has reported that intrathecal CD4+ T cells from HLA-DRB3 positive MS patients reacted with GDP-L-fucose synthase, an enzyme frequently expressed in human cells as well as in bacteria commonly present in the gastrointestinal track of MS patients. This tantalizing finding warrants further investigations to determine if gut bacterial GDP-L-fucose synthase is indeed the primary trigger for the activation of autoreactive T-cells that subsequently migrate to the brain and lead to demyelination. We propose that EBV infected memory B-cells act as antigen presenting cells (APC), resulting in the activation of helper T-cells, which in individuals carrying certain HLA haplotypes, activate autoreactive B and T-cells targeting antigens expressed on oligodendrocytes (Figure 1) [...] While most of the EBV infected B-cells infiltrating into the brain remain latently infected, a small percentage are triggered to undergo lytic replication, which could explain how CNS resident astrocytes and microglial cells get infected. The Epstein-Barr virus (EBV) is a ubiquitous pathogen that imparts a significant burden of disease on the human population. EBV is the primary cause of infectious mononucleosis and is etiologically linked to the development of numerous malignancies. In recent years, evidence has also been amassed that strongly implicate EBV in the development of several autoimmune diseases, including multiple sclerosis. Prophylactic and therapeutic vaccination has been touted as a possible means of preventing EBV infection and controlling EBV-associated diseases. However, despite several decades of research, no licensed EBV vaccine is available. The majority of EBV vaccination studies over the last two decades have focused on the major envelope protein gp350, culminating in a phase II clinical trial that showed soluble gp350 reduced the incidence of IM, although it was unable to protect against EBV infection. Recently, novel vaccine candidates with increased structural complexity and antigenic content have been developed. The ability of next generation vaccines to safeguard against B-cell and epithelial cell infection, as well as to target infected cells during all phases of infection, is likely to decrease the negative impact of EBV infection on the human population.